The 10 Best Museums in West Virginia! Whether you're interested in learning more about history or military strategy and battles, famous West Virginians, industry, art, music, transportation, or farming, there's a museum for you in West Virginia. With more than 200 museums in all parts of the state, you can spend a weekend or a week exploring, learning, and celebrating. Below are links to just a few choices that will get you started on your journey of fun. This is the family home of Belle Boyd, famous for being a spy for the Confederate Army during the Civil War. Located in what would eventually become West Virginia, Belle's family were Southern sympathizers and Belle was a well-educated woman who used her talents and beauty to gain information. Her family often had Union soldiers stop by in the general store that was part of the house. If you're a history buff, this is worth visiting. Filled with newspaper clippings, eyewitness reports, and hand-rendered drawings supposedly of the Mothman, this is a fun and entertaining museum. Made well-known by the book and movie "The Mothman Prophecies," Point Pleasant is the site of the Silver Bridge collapse in 1967 that many locals believe was prophesized by the sightings. Born in Hillsboro, West Virginia, but raised in China with her missionary parents for most of her life, Pearl S. Buck was a moving force in breaking down international walls between the United States and China. This Pulitzer Prize-winning author began her life in this simple hand-built house nestled in the heart of the Appalachian Mountains. In addition to being one of West Virginia’s best family-oriented state parks, Cedar Creek State Park has a reconstructed log cabin that is used for camp check-ins. There is also a one-room school house in the park that contains original student and teacher desks complete with inkwells, a pot-belly stove, and school books from the 1800s like “Ray's Arithmetic” and McGuffey Readers that children used. Open to the public and for private programs, this wonderful children's museum provides opportunities for kids to dress like early settlers, build a castle, climb a rock wall, learn basic woodworking skills, and much, much more! 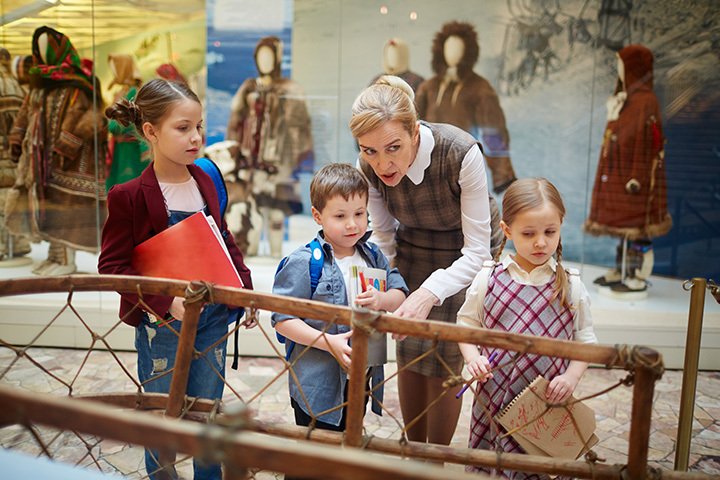 Aimed for children up to fifth grade, this inexpensive living history and hands-on museum is one you won't want to miss if you have little ones with curious minds. Opened in 1995 with the mission to restore and preserve military equipment, educate visitors, and honor veterans, this private museum is home to more than 35 vehicles that were used in combat before being retired. You can see a variety of uniforms from every branch of service, ammunition, radio equipment, field and mess gear, and much more from the Civil War, World War I and World War II, the Korean War, Vietnam, Afghanistan, Desert Storm, and Iraq. If you're looking know more about the role coal played in our nation's history, there's no better place than The National Coal Heritage Area and Trail, a nationally-designated area maintained by the National Park Service. This scenic drive will take you through 13 counties in southwestern West Virginia and over 187 miles of unique cultural heritage. You'll have a choice of one and two-day trips that will allow you to see railroads that helped move the coal to production, and stop by numerous points of interest like the Beckley Exhibition Coal Mine and Museum, the Whipple Country Store, Heritage Farm Village, Blenko Glass Factory, Princeton Railroad Museum, and historic Matewan. If art is your thing, then you won't want to miss The Parkersburg Art Center in downtown Parkersburg. The center includes six galleries including one for children and host special exhibits all year-round. In addition to seeing the beautiful local art, there's a custom frame and gift shop where you can select a special memento to take home. Having a sense of our history gives us a vision for our future and that's one of the founding goals of the Wyoming County Historical Museum. Visitors will find collections that seek to preserve the history of this part of the state and opportunities to tour buildings and see monuments and roadside markers that lead along Civil War trails. The Paul Ray Blankenship Research Center is part of the museum and there is information available on family histories and private contributions that will delight anyone looking into their genealogy. Train buffs young and old will find just what they're looking for at the Huntington Railroad Historical Society. This non-profit organization was created with the goal of preserving railroad history. Boarding in the area, there are numerous excursions that can be taken during the year where passengers can see some of the prettiest scenery in the nation. The free Tri-State Model Railroad and Classic Car Show is held in March of each year and fills over 60,000 square-feet of space. There's also an outside museum where visitors can see actual trains and other railroad equipment.